Posted by Bravado Cooking for Men in Classic American Dishes. After playing golf, a good friend suggested that I have dinner at his house. Gary is wine fanatic and I knew there would be some liquid treats involved. He owns a company that rates wines, The Beverage Tasting Institute, which has a great website. They have no financial relations with any of the vintners, who have to pay to have their wines rated, and therefore the results are very objective. His wife Priscilla is a great cook and has appeared before on Bravado Cooking in A Perfect Super Bowl. When I heard she was cooking perch, I immediately accepted the invitation. Freshwater perch are, in my opinion, one of the great fish dishes. When I was young, my grandfather would take me fishing on Cedar Lake in Indiana. It was a great lake for perch and other pan fish. Cleaning was laborious, but my grandmother would lightly bread and deep-fry the little filets and we soon forgot the work. It was wonderful. Commercial perch fishing has made a comeback – in Lake Erie of all places. Remember in the 80’s when we thought that this great lake had died? Well, through enormous environmental efforts to clean the wastewater discharges of Cleveland and Detroit, which dumped huge quantities of nitrates and phosphates into the water, that lake has been resuscitated and is doing much better. In the 60’s and 70’s the concentration of nitrates and phosphates had become so high in Lake Erie that it began to affect the Mayfly population. Mayflies are about 1-1/2 inches in length and are the primary food source for yellow perch. They lay their eggs in the water, but they are very sensitive to high nitrate and phosphate levels. As the nitrates and phosphates increased, the Mayflies disappeared and so did the perch – the population dropped from about 90 million in 1960 to about 15 million in the early 90’s. The $100 billion in environmental expenditures during the 80’s and 90’s started to tip the scale, and by 2000 the Mayfly population was growing again, to the great benefit of the perch. Perch population is now about 70 million and rising. 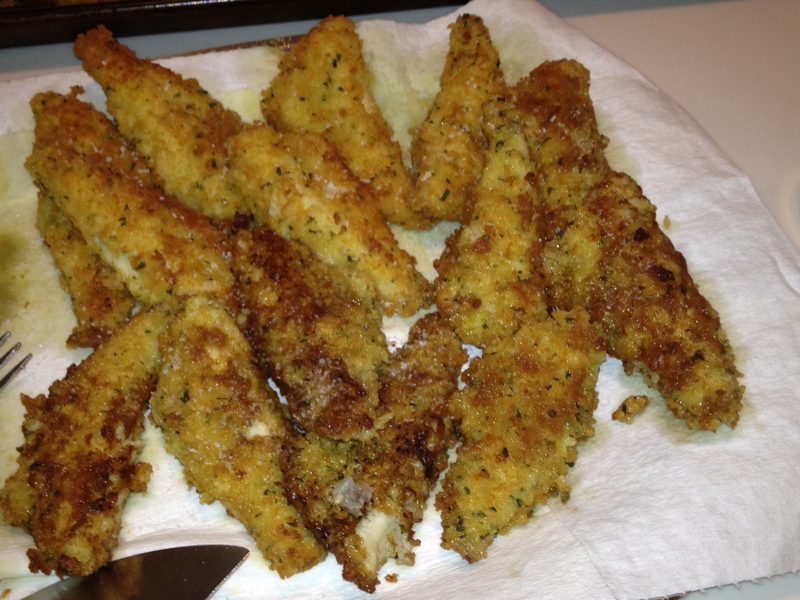 Lake Erie perch, though expensive, is now commonly available at most fishmongers. Priscilla prepared perch with Tater Tots. I had forgotten how much I like Tater Tots. You buy them frozen, plop them in the oven on a baking sheet and watch everyone’s eyes light up when you serve them. It’s not very Bravado – we like to do everything from scratch – but we have to make some exceptions. Bake the Tater Tots in the oven per package instructions. Start this first so they are ready at the same time as the fish. Heat about ¼” of vegetable oil in a large frying pan over medium heat. In one shallow bowl, whisk a couple of eggs. In another bowl, mix one cup of flour, one cup of Pankco breadcrumbs and one tsp. of salt. 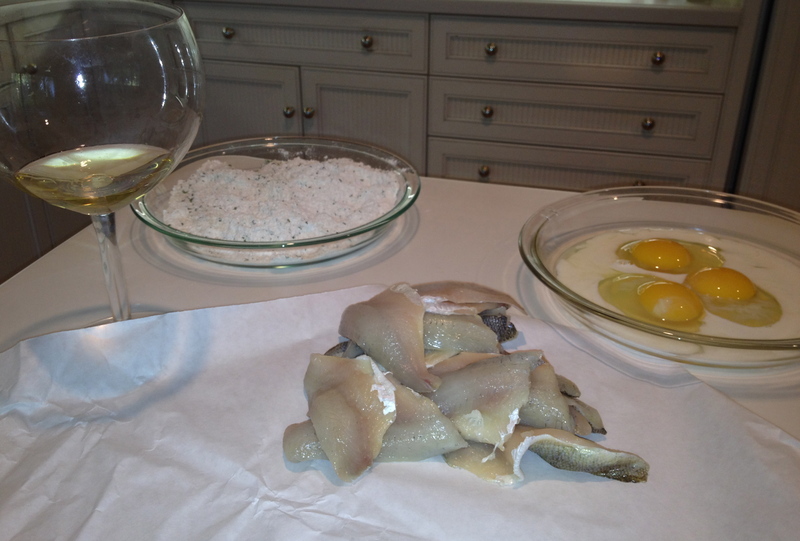 Dredge the perch filets first in the egg and then in the flour/breadcrumb/salt mixture. Cook the filets about 2 minutes on each side and cool on paper towel. Serve with some good Tartar sauce. Gary served some magnificent wines that night. 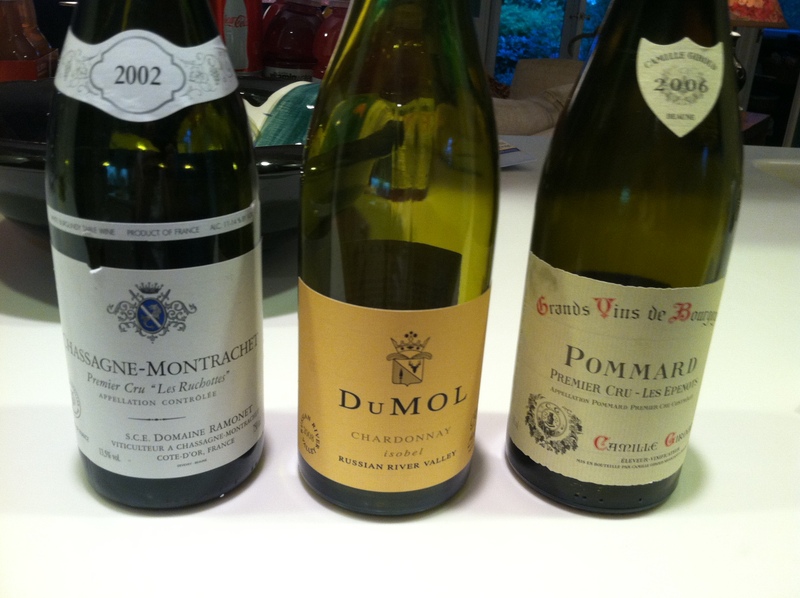 For some unknown reason, we decided that three people did, indeed, need three bottles of wine, and they were great. See if you can find some of these.